Hanna is the type of child any father—or mother, for that matter—would be proud of. She loves her daddy so very much. Her mother, on the other hand, she can do without. From the moment, she’s been able to speak, she’s chosen to keep her own voice hidden. She’ll give her daddy all her love. For Mommy, however, she has nothing. I’ve had the privilege of reading such an intriguing book. Zoje has crafted such an intense story that you often find yourself rooting for both Suzette and Hanna. These are two complex characters who often mesh in more ways than one. Granted, they’re also opposites. Zoje has given us a child who wants nothing more than to be a princess in her daddy’s eyes. This is something anyone can relate to, since as children growing up, people often strive to make their parents love them more. This fact is shown quite clearly throughout the story itself. There’s nothing Hanna wouldn’t do to please her daddy. Her dislike for her mother is palpable. She’s the type of child who refuses to accept the circumstances set upon her. Hanna has made up her mind when it comes to her mother, often unwilling to abide by her mother’s rules. Zoje takes us for a ride from the moment we start reading. She’s written a relatable story, one where a child will do whatever is necessary to assert him/herself in the world they live in. There are a good many children out there who aren’t satisfied with the lives they lead. They often take matters into their own hands, not once thinking about the consequences of their actions. In Baby Teeth, Hanna is no different. She just wants to be accepted by her daddy without her mommy ruining the perfection she’s crafted around her from the moment she began understanding the world around her. I can’t wait to see what Zoje has in store for us within this beautiful, bittersweet, and chaotic world she’s created. An author of dark and suspenseful novels, Zoje lives in Pittsburgh, PA. 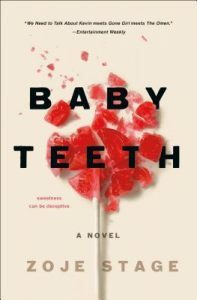 Her debut novel BABY TEETH (St. Martin’s Press) will be released 17 July 2018. It will be released in the UK as BAD APPLE (Transworld) on 9 Aug.